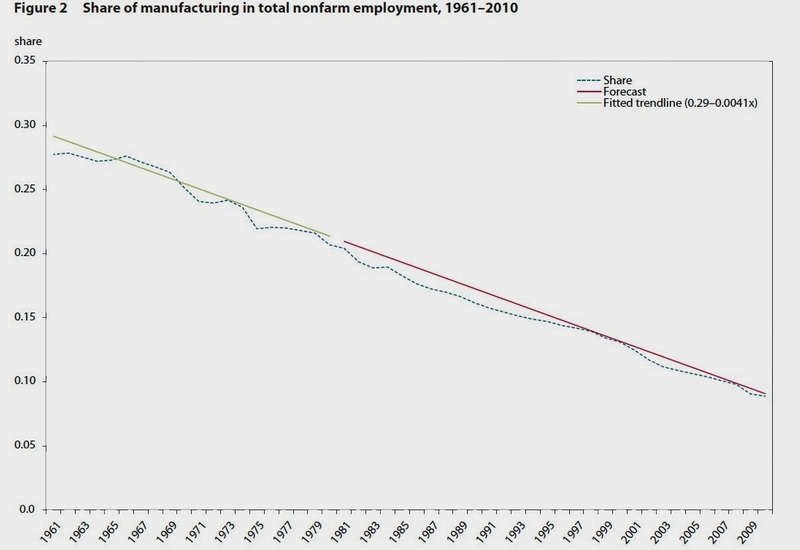 There are two main responses to concerns about the U.S. manufacturing sector: either the changes in manufacturing are mainly part of a long-run structural shift that goes back decades in the U.S. economy and is happening in high-income economies across the world, or there is something new and worrisome happening in the last decade or so. Robert Z. Lawrence and Lawrence Edwards discuss "US Employment Deindustrialization: Insights from History and the International Experience," written as Policy Brief #PB13-27 for the Peterson Institute for International Economics. They come down more heavily on the "long-run structural shift" side of the argument. 1) If you measure the output of the U.S. manufacturing sector in terms of the value-added in that sector, there is no trend up or down in recent decades. As Lawrence and Edwards write: "Measured in 2005 dollars, manufacturing share of gross US output was 17.5 percent in 1947 and 17.3 percent in 2005. 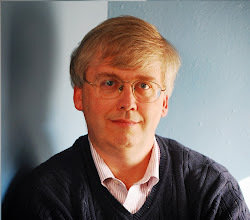 Between 1947 and 2005 the share averaged 17.3 percent and was essentially trendless ..." Value-added is calculated by taking the total revenues of a firm and then subtracting the value of purchased inputs of goods and services: thus, it includes not only profit but costs of labor and depreciation incurred by the firm itself in the course of production. 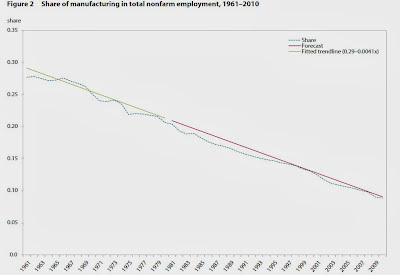 2) The number of jobs in manufacturing has fallen over time; in particular, the total number of U.S. manufacturing jobs didn't change much in the 1990s, but the U.S. manufacturing sector lost 5.8 million jobs from 2000-2010. However, Lawrence and Edwards point out if you look at the proportion of total U.S. jobs that are in manufacturing, it looks like a straight-line drop over time. of US spending on business research and development—and it regularly outstrips the rest of the economy in productivity growth." Taking these factors together, a pattern arises that is familiar across high-income economies. For the U.S. economy, the price of manufactured goods relative to services has been dropping about 2% per year since 1960, driven by the relatively faster gains in productivity in the manufacturing sector. 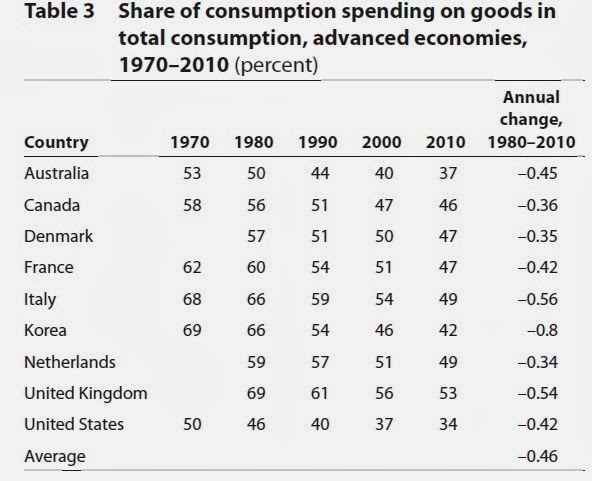 Consumers have increased their purchases of goods relative to service by about 0.5% per year since 1960. Putting these together, the amount spent on goods relative to services by U.S. consumers has been dropping about 1.5% per year since 1960. Thus, it takes fewer workers in U.S. manufacturing to produce the goods that American consumers want to buy, and this would hold true even if there was no international trade. Lawrence and Edwards readily admit that trade makes a difference to the U.S. manufacturing sector, too. If the U.S. economy didn't run large trade deficits, they estimate that U.S. manufacturing jobs would be at a higher level--but such jobs would still be steadily declining over time at about the same rate. These issues are common across high-income countries. Here's a table showing the decline in U.S. manufacturing jobs compared with some other high income countries, and the U.S. experience is about average. 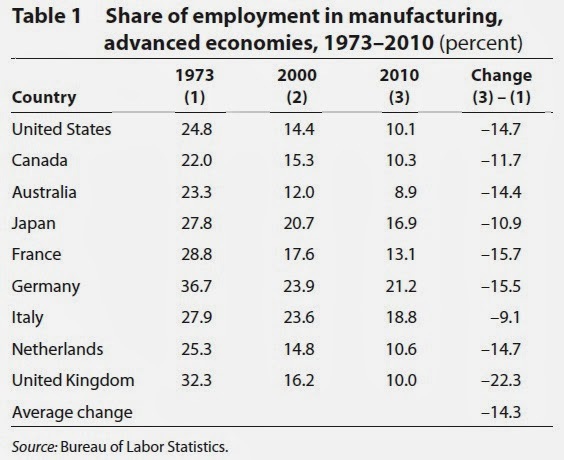 Notice that countries like Japan and Germany, which have often had substantial trade surpluses in recent decades, have still experienced a decline in manufacturing jobs. 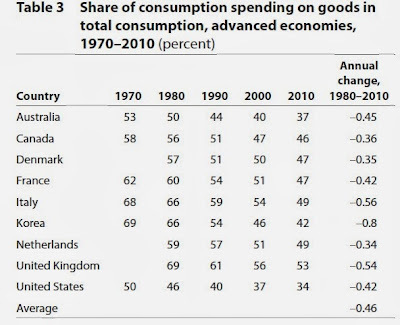 The drop in the share of consumption represented by goods is also common across these countries. There are some potential bright spots for U.S. manufacturing. Cheaper energy in the U.S. economy would give the energy-intensive manufacturing sector a boost. A reduced trade deficit and stronger recovery from the Great Recession would help manufacturing jobs. Advances in automation could improve the competitiveness of the U.S. manufacturing industry, although it would also contribute to the long-run decline in jobs. Similarly, wrapping the U.S. manufacturing sector into global supply chains can be a way to preserve U.S. manufacturing expertise--and in the 21st century, being apart from global supply chains in some sectors be an economic death sentence. New high-value, high-technology products may be manufactured in the U.S. economy. But while these steps can help keep manufacturing a lively and important part of the U.S. economy, the long-term decline in manufacturing jobs seems likely to continue. Finally, here's a post from about a year ago on a global manufacturing report from the McKinsey Institute that includes useful figures showing patterns of manufacturing output and jobs over time in different countries.